Many YouTube creators pour themselves into making videos that they’re proud of, videos that they feel are worthy of an audience, not just because it’s a great video, but because it has the potential to influence someone’s life. But that audience never comes. The video sits quietly on YouTube while billions of monthly viewers direct their attention elsewhere, completely unaffected by the message in your video. Why? Why do some channels quickly gain traction while others struggle for years? What does it take to grow a YouTube channel from a few passive viewers to an engaged community that can be mobilized for good? Tim's clients have earned over 14 billion views and 61 million subscribers with his guidance. Not only does he study audience growth, but he practices it every day on his own YouTube channels and that of his clients. Tim Schmoyer is one of the most talented YouTube consultants out there. We found his approach and style very refreshing and relaxed! Tim does not only focus on analytics, but he really helped us take a closer look at our content and the “story” that we are telling. Implementing some of his strategies has allowed us to grow our channel, reach our target audience, and share our family story in a more compelling way. If you are looking to grow your channel, increase your revenue, and/or get no-nonsense coaching from someone that knows what he’s talking about, then we recommend that you work with Tim Schmoyer! Tim’s consulting services are priceless! He always goes above and beyond every time we use him. He has helped us make some big decisions, coaching us on things to do and not to do that have helped our YouTube channel and business grow. I would recommend him to anyone trying to grow an audience on YouTube or keep an existing audience happy. Thanks for all your help Tim! Tim can discuss pretty much anything related to YouTube, although his area of expertise lies in audience development and forming channel strategies to achieve those audience goals. Unfortunately, viewers don’t just show up on their own. You need to find a way to get your videos in front of your target audience and present your content in such a way that makes them feel compelled to subscribe. But even once they subscribe, you want to build a loyal community of subscribers that interact, engage, and promote your videos on their own initiative so your message influences as many people as possible. Audience growth on YouTube is Tim’s area of expertise and he’d love to help you grow yours through organic and meaningful ways. Tim can help you create a strategy that helps build exposure for your YouTube videos. He’ll discuss ways to tweak your videos so they more effectively convert viewers into subscribers. Tim can evaluate your subscriber base with you and discuss ways to turn them into a dedicated online community. Sometimes it’s helpful to have a second pair of trained eyes on your YouTube channel. Especially if you’ve been staring at it for a few years, it’s easy to miss the holes in your channel design, branding, strategy, SEO, content, and audience development that are causing you to miss opportunities with your viewers. Tim can study your channel and discuss ideas with you on how to close gaps and optimize your channel. A quick one-session channel review with Tim can help you pick out the big, glaring areas for channel improvement. Tim can dig deep into your channel with you across several sessions to really fine tune your channel to it’s maximum potential. Most channel reviews take place in a video call, written YouTube channel audits are also available at an additional fee. Contact Tim for more info. A lot more goes into growing a YouTube channel than making awesome videos. That obviously helps, but your channel needs to have an intentional strategy that makes all your videos and the channel design itself feel like a unified, cohesive experience. That includes your channel’s branding assets, the message they communicate both intentionally and subconsciously, how you position your YouTube videos for your audience, the thumbnails you use, and much more. Tim will work with you to create a strategy helps your channel quickly and clearly communicate the value it proposes to the viewer. Tim can also discuss how to tweak your content so the value of your channel is evident in every video. Together, you and Tim can brainstorm new ideas for making your channel as sticky as possible for your target audience. A solid video strategy is necessary for any YouTube channel, including who you’re targeting, what they value, how you offer that value, and do so in a way that they prefer to consume. However, even if you answer those questions perfectly, it still doesn’t necessarily lead to a successful video strategy because you have to craft that content in a way that’s designed to work well on YouTube. For example, most creators try to create videos that emulate what they see on television and then wonder why the videos aren’t working on YouTube. The two platforms are very different: one is social, one isn’t. Tim can help you create a custom video strategy for your YouTube channel that’s designed to meet your goals. If you already have a series that isn’t accomplishing what you hoped it would accomplish, Tim can discuss with you ways to improve future episodes going forward. He can also discuss with you ideas for other video strategies that might be more effective than the one you’re currently pursuing. YouTube is the second-largest search engine in the world, trailing only Google, it’s owner. Because of the relationship between YouTube and Google, it’s important to optimize your YouTube videos in such a way that drives search traffic from YouTube and Google to your videos. However, Google and YouTube both track many data points and signals from viewers to determine how valuable your video is and how to rank it in search results. Tim can teach you how video SEO works and show you how to optimize your videos so they have the highest potential for ranking in search results. Tim can evaluate your current video SEO tactics and show you areas for improvement. Tim can teach you how to efficiently research titles, tags, and description text that will help Google know exactly what to rank your video for. Since much of video SEO is based on the signals your viewers send to YouTube and Google about the video, Tim can discuss ways to craft videos that are more likely to prompt viewers to give positive signals to YouTube and Google. Tim can also help you with a number of other YouTube projects and questions that don’t specifically revolve around audience development and strategies for channel growth. Since creators all look to YouTube for a variety of reasons and find it to be a valuable solution for many different projects, he’d love to hear how he can best serve you. Consider some examples from below. When necessary, Tim is well-connected and can often put you in touch with others to assist you, as well. Tim can discuss the viability of your idea for a new YouTube channel. He can develop ideas for how to collaborate with other creators to promote your product or service. Together you can explore options for creating a video website off of YouTube. Often a new YouTube creator seeks advice from Tim before they even create their channel and launch it. Rather than investing a lot of time and energy into a plan that may not work, they meet with Tim to plan a YouTube growth strategy that’s integrated into their videos from the very beginning. The following charts show how two such channels took the action steps Tim provided and grew to around 30 million views per month only 6 months after creating their YouTube channels. Schedule a 1 hour one-on-one session with Tim Schmoyer and start reaching your goals on YouTube. Tim is one of the only YouTube Certified consultants who is also a dedicated YouTube creator himself. In a normal week he creates 4 YouTube videos. He lives and practices this stuff every day both on his own YouTube channels and on client channels. Much of what he knows about YouTube has been learned through 10+ years of hands-on experience, not just from reading theoretical blog posts (although, he does that, too). His approach to YouTube is unique and has caused many people’s channels to very quickly double their growth. Tim uploaded his first video to YouTube on March 2, 2006, as a way of introducing his girlfriend to his family half way across the country. They made videos of themselves going out on dates, getting engaged, married, moving into their first house, having kids, and still continue to this day. Since that first video, Tim has personally created and published over 3,000 videos to YouTube, earning over 50 million views. He’s now an official YouTube Certified Consultant in “Audience Growth” and has worked with many top Fortune 100 companies and YouTube creators alike. Mike Conley, YouTube Creator: In April of 2012 I decided to try and improve my YouTube Channel to increase revenue and exposure in a crowded marketplace. I had no idea how to do that and floundered until I found Tim Schmoyer. By employing his techniques I quickly saw my channel explode to heights I never thought possible. Smart Kids Club: Before my channel review with Tim, I wasn’t sure if I was doing everything right. He really pointed me in the right direction with my channel. For example, the video statistics below are from a video that sat on YouTube for 9 months. It didn’t do too well, but after following Tim’s tips and advice you can see that the video started doing a lot better. Within a few weeks it jumped from almost nothing to over 100,000 views. WHO: Designed for YouTube creators who are ready to take their channel growth seriously. SIZE: For creators with around 0-30,000 subscribers and 0-300,000 views/month. WHAT: Review your channel with one of Tim’s team members who understands YouTube success inside and out. RESULT: Form an action plan for getting more views, subscribers, and start the process of making money on YouTube. SESSION: A 1 hour private discussion with a member of Tim’s team. WHO: Designed for creators and businesses who want to take their channel and revenue to the next level. WHAT: Review your channel with Tim. He’s one of the world’s leading experts in audience development and online video marketing. RESULT: Form an action plan for removing the roadblocks and friction points that are holding back your channel’s reach and revenue. SESSION: A 1 hour private discussion with Tim Schmoyer. My wife and I have been full-time YouTube creators for several years, but we knew we had more potential to grow. We just weren’t sure where to focus our efforts, so I met with Tim to review our channel. By the end of our consultation I had four pages of written notes and a list of action steps that were designed to help us achieve our goals. He revealed a lot of insights that will have a big impact on how we grow our channel and its business. There’s a lot of exciting opportunities coming up for us and we feel better equipped to leverage them now. I decided to contact Tim in order to get a better understanding as to how I could maximize my channel. We have a dip over over 10 million views and I knew I needed someone to help me understand what needed to be done. It was really easy to set up a meeting and we brought loads of questions. The session was awesome and super informative as well as laid back and easy to understand. The impact it had on our channel was huge. We had almost a page of changes to make. Some small and some large. I contacted Tim after the first channel I created was struggling to get noticed. Despite doing everything I thought was right and spending an enormous amount of time on the videos they just weren’t doing well. 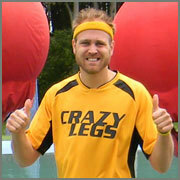 Tim showed me everything I was doing wrong and offered invaluable insights and strategies for me to use moving forward. He went over everything from thumbnails to choosing trending themes. I decided it would be best to create a new channel using Tim’s advice. 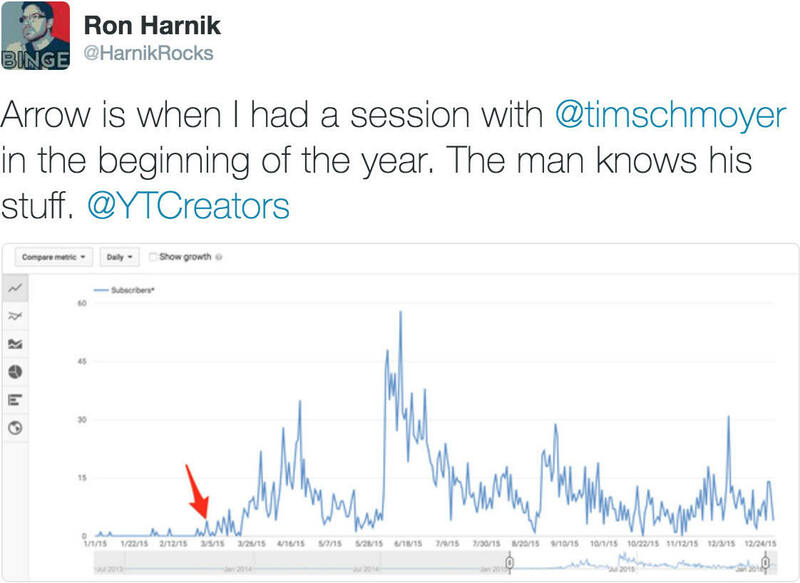 The arrow is when I had a session with Tim Schmoyer in the beginning of the year. The man knows his stuff. I'm not sure which consultation is best for me. How do I choose? Each member of our team is qualified to provide expert advice in any of the above-mentioned areas. They’re all very experienced on YouTube. Your channel is in very good hands. However, some team members have more experience in some areas on YouTube than other members, so pick the consultation that meets your most pressing goal and feel free to address other questions during your session together. Creators who want to grow subscribers and views. Identify a target audience and value proposition to more easily convert viewers into subscribers. Fine-tune your content, including the format, story, edit, call-to-actions, and more. Establish a content schedule that works for you and your audience. Creators who want to make YouTube their full time job through product development, brand deals, affiliate marketing, and Patreon communities. Video marketers who want to convert YouTube into a positive ROI. Brands and creators who want to dig into fan psychology and implement elements into their videos that turn viewers into super fans. Creators who are ready to start scaling their YouTube business by building a team around their channel that facilitates even further growth. Marketers who want to convert a YouTube audience into website traffic, email lists, and sales. Explore other video distribution platforms beyond YouTube that make sense for the creator’s goals. Of course, you can always email us team@videocreators.com if you need help determining which consultation is right for you. I don't have a channel, but want to get started on YouTube. Can Tim help? Yes! In fact, under the, “Channels Tim helped launch,” heading further up this page there’s a few screenshots from channels Tim worked with before they even created their channels. Around 6 months later, each channel was earning 30 organic million views per month! Obviously, every channel performs differently due to many different variables, so there’s no guarantee that your channel will do the same, but discussing your YouTube growth strategy with Tim before launching your channel is a great idea. Avoid investing a lot of time and resources into a strategy that may not best reach your goals and book a consultation. Let’s talk! I want advice, but I can't afford the consulting fee. What other options are there? Tim has written a day step-by-step guide that will walk you through everything you need to do on your channel to optimize it for growth. Many creators find it beneficial to work through that resource on their own and then schedule a consultation with Tim when they complete it. Tim will evaluate your work as well as help you customize the principles specifically to your channel and goals. If a private, one-on-one consultation with Tim is outside your budget, then that’s the next best resource we recommend. It’s helped both new creators as well as established ones grow their channels significantly. Plus, the first 3 days of the resource are free, so start there and see what you think. What's your refund and cancelation policy? Rescheduling: When you schedule your appointment you’ll receive a confirmation email that contains the details of your session with our team. Inside that confirmation email there’s a link where you can reschedule your session at anytime up to 24 hours before your scheduled session time. After that, your session is locked in and cannot be changed nor refunded. Refunds: We will issue a full refund up to 24 hours before your session. There are no refunds after the service has been rendered. Cancellations can be made by sending an email to team@videocreators.com. Late Shows: If you’re late to your meeting, our strategists will wait for 15 minutes after the start of your scheduled meeting for you to arrive. After that, they are free to leave the meeting. There are no refunds for arriving late nor will the strategist be able to extend your meeting longer than the scheduled time due to other meetings that may be scheduled after yours. Do you offer channel management services? Yes, we do. It’s actually part of a one-year partnership between your channel and the Video Creators team. We write up an audit of your YouTube channel, map out 12 months worth of action steps to reach your goals, have several consultation meetings with you, give you unlimited direct access to us, and send you monthly reports to help you stay on track to meeting your goals. On top of that, we can optionally optimize your YouTube channel’s metadata, thumbnails, playlists, end screens, interactive cards, and more for you. Just reach out to us at team@videocreators.com for more info.